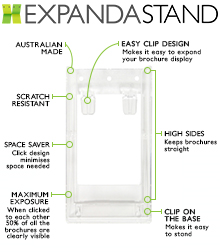 Freestanding brochure carousel display using A5 Expanda brochure holders. Kit comprises of the following items: Stainless steel base and pole. 4 plastic 315 wide spinners for A5 4 plastic moulded collars to hold spinners in place. 24 A5 brochure holders.